Well the last release was a little over nine months ago, how crazy is that? You’ll notice with this release I jumped a bunch of version numbers. The reason for that is because of all the massive changes. I know I had said the core rules were solidified at the v1.0 release, and in a sense they still are, but yeah, v1.9 and forward will be different than prior releases. What I’m planning to do is release v1.9, let it simmer for a bit, and then release the “final” version as v2.0. This is because I might have missed typos or other errors just due to the sheer size of the changes. First of all, here is the brand new Dinosaur Cowboys Rulebook v1.9. Anyway, I keep talking about big changes, so let’s hear them (ordered biggest change to smallest)! – Renamed the statline, which is now: DEF, RTN, CTN, BTN, SPD, HP. That would be Defense (Armor Rating), Range Target Number (Ranged Miss Chance), Close Target Number (Melee Miss Chance), Bravery Targer Number (Bravery/Gutless), Speed (Movement), Panic Speed (Panic Movement). The reason for this was to apply a consistent naming to the lower-is-better stats (RTN, CTN, BTN). Also Defense makes more sense in terms of dinosaurs and lightly armored cowboys. Speed also sounds better since then the Maneuever Phase can become Movement Phase instead. Also Defense is written as +X, and Speed as X” instead of both being flat X. The use of these statistics doesn’t change much, it’s more just a redone naming and reorder of the stat line. To get an idea of what the new statline looks like see this example posse roster. 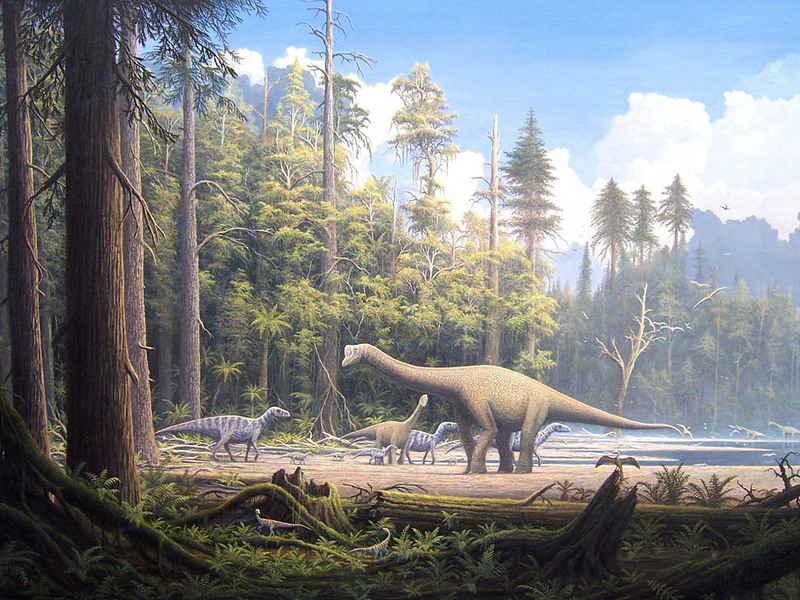 – Dinosaurs now ignore Difficult Terrain, due to their massive size. This also makes moving a big dinosaur toy MUCH easier on a cramped table. – Added 40 Features to provide some extra variety to games, such as Duststorms, Volcanos, Traps, Weapon Emplacements, etc. Like I said, a TON of changes. I maybe should have done an intermediate release, now that I realize how far out of date the old v1.3 was compared to the current. For now I’m going to take a break, play some Dinosaur Cowboys, and make sure v1.9 is solid and there aren’t any unconverted stats or other typos. I have a 4-player game lined up tomorrow so that will be fun. With luck v2.0 will be out in the next month or two. 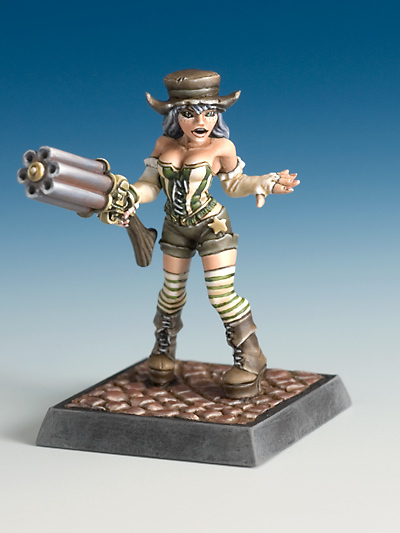 I found two really cool Steampunk style figures from a German company called Freebooter Miniatures. There is Doc Taranto who I think is great as a kind of mad scientist Neotechnoist. 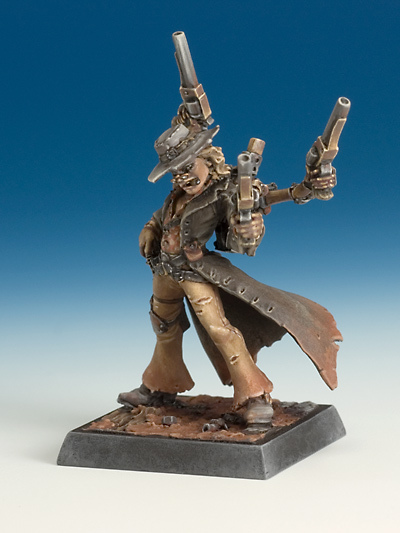 And then Dixie Dynamite who is a bit unrealistic but still makes a fun swashbuckler style cowboy. Definitely not the usual fair, and a bit more stylized in general, but still pretty cool! 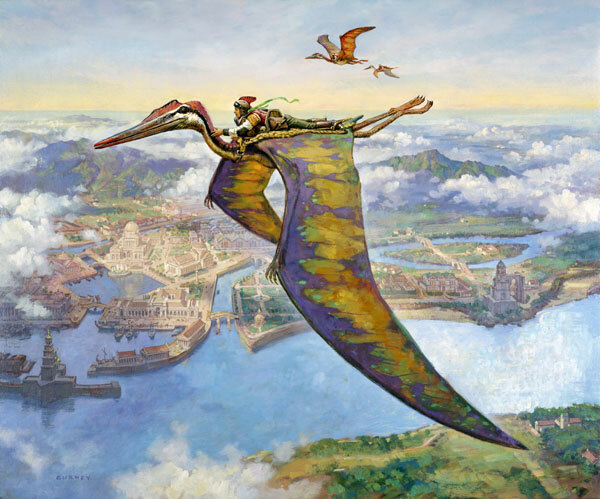 Click for the full size. Anyway the blog has been silent for the past few weeks, and will continue to be that way until October. I’m busy travelling at the moment so I haven’t been back to the kitchen table for some wargaming or painting. 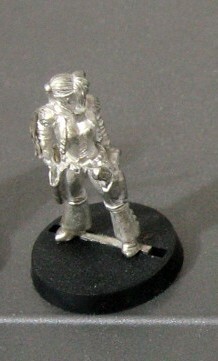 Which is too bad since I wouldn’t mind trying out my new cowboy figures and getting back to rolling some dice. Otherwise I did a minor fix to The Saloon around remotely loading invalid posses. Previously if you tried to load a posse that came up invalid (such as having less than 0 Improvement Points remaining) the app would just error out and not load the posse. 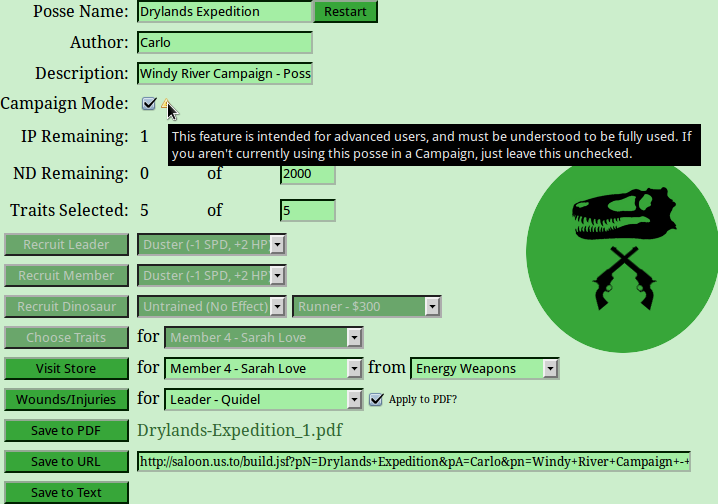 However this became a problem when trying to load some posses created with older versions of the Dinosaur Cowboys rules. For example The Herd Mothers, a neat posse idea, but they have -6 IP under the v1.3 rules. So the fix is to instead display a popup (should be cross browser compatible, but maybe not) which warns the user that the posse they tried to load is invalid. But then it still loads it. This is great for at least seeing the posse, or maybe trying to change it to be valid against the latest rules. Well here we are again for another point release, in this case v1.3! It feels close on the heels of v1.2 but that’s because I haven’t been posting as much, since it’s actually been two months since a release. Get the Dinosaur Cowboys Rulebook v1.3 here. – Removed a lot of items from the table of contents to streamline its size. Might have gone too far though. – Reordered the combat modifiers table (also on the QRS) to be more readable and easier to follow a process, instead of a hodgepodge of modifiers. – More minor editing, especially around the later sections that don’t get as much reading. Discipline, Variant Rules, etc. – Added a Save to Text option that will export the Posse in a consistent plain text format, useful for battle reports or posting directly to forums. I still have the general idea of writing a basic campaign for players to try out some linked, story driven battles. I’ll also keep on keepin’ on with my battle reports and post those when I can. As usual more minor editing and fixes are always in my mind. I wouldn’t mind getting someone to update the rulebook formatting to be more professional instead of a plain black-and-white document. Well after some more tweaking, balances, and editing I am releasing Dinosaur Cowboys v1.2. Hooray! Get the Dinosaur Cowboys Rulebook v1.2 here. In terms of changes here are the highlights, straight from the Subversion commit log. The biggest change was around the stats of the dinosaurs, plus the two new classes (Terror and Fin), plus some new weapons. – Changed the Panic MV header to PMV in the dinosaur list to better match how the roster sheet and other abbreviations are used. 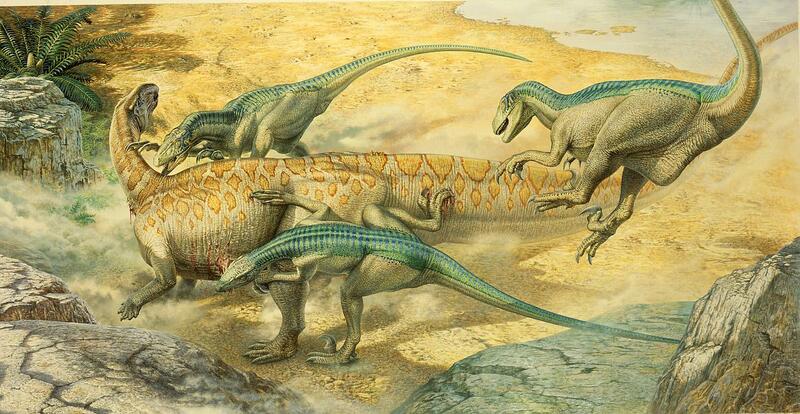 – A bunch of dinosaur changes. First of all King was moved to a new class, and the old version was renamed Terror. A new Fin dinosaur was added. A bunch of stats were modified as well, mainly HP and MV adjustments to balance everyone. – Added an Aimed Shot variant rule, made a note of recommended variant rules, re-added the brainstorming variant rules. – Added a new rule for multiplayer games where each entity gets +2 HP per player beyond 2, to increase survivability against more enemies. – Also added a combined image of the common weapons to the Weapon Description section. – Renamed the Movement Phase to Maneuver Phase, since the Action Phase isn’t called the RMC Phase, so the Movement/Maneuver Phase shouldn’t be named after a stat too. The downside is it’s tougher to spell. Also The Saloon received a bunch of bugfixes which I’m really happy with, plus of course all the v1.2 changes were ported into it. – Lots of changes around Traits. Previously some of the non-stat Passive traits weren't being applied, such as Clear Sight which modifies ranges of weapons. This actually ended up being a bit of a hassle because we needed to clone the Weapon object, manage string based range brackets, etc. As before I don’t have any drastic plans for the rulebook. Maybe some tweaking and formatting and editing here and there, but as I promised with v1.0 the core mechanics will stay the same. I’ve been thinking of adding some items that have more of an in-game effect, like a Bugle or Trumpet that let’s a non-character use the Yeehaw! ability. Maybe various types of alcohol that can be used like drugs in other games to provide bonuses for a turn. 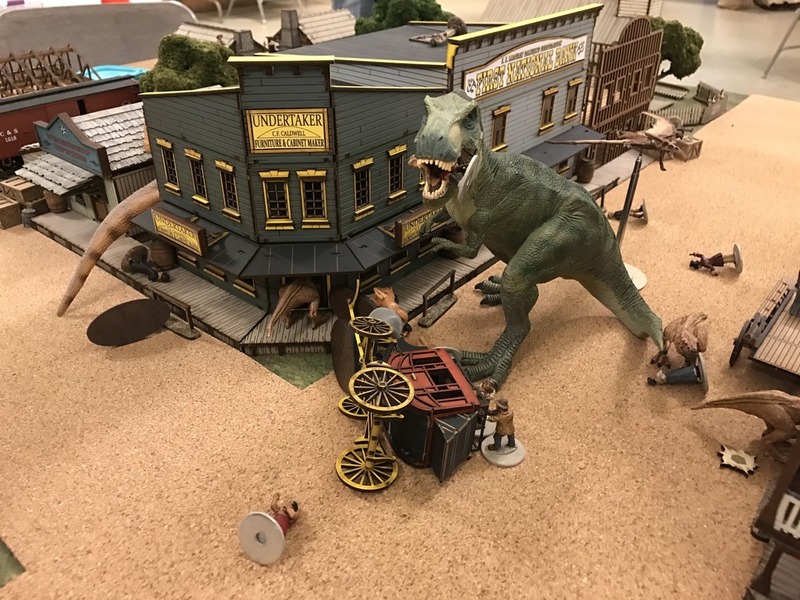 One goal I do have is to make a standalone campaign module for Dinosaur Cowboys, complete with Hexographer maps, scenarios for each location, general plot twists, etc. That might be more of a pipe dream than a goal, but I could see it being fun and adding a lot of value to the game.